Officer Jeronimo Yanez pulled Castile’s car over in Falcon Heights, a suburb between Minneapolis and St. Paul, and the officer later said he thought Castile matched the description of a suspect in a robbery. The stop quickly escalated. Police officers are seldom charged for fatal on-duty shootings, and convictions are even less common. Castile’s death came at a time of intense scrutiny of fatal police-involved shootings, and the viral video of his final moments spurred heated demonstrations that continued for weeks. Later in the evening, hundreds of people gathered on the steps of the state capitol in St. Paul to protest the verdict. Prosecutors charged Yanez with second-degree manslaughter in November, a felony, saying that “no reasonable officer” would have used deadly force in the same situation. He was also charged with two felony counts for intentionally discharging the gun. Jurors began deliberating Monday, and the verdict was announced Friday afternoon. Earl Gray, an attorney for Yanez, praised the jury’s decision. During the trial, jurors heard testimony from dozens of witnesses, including Yanez, who cried on the stand while saying he did not want to shoot Castile. Yanez testified that he thought his life was in danger, and attorneys for Yanez have argued that Castile caused his own death because of his actions during the traffic stop. Castile was one of 963 people whom police officers fatally shot last year, according to a Washington Post database tracking such shootings. The fatal encounter in Minnesota was among the most high-profile last year because Diamond Reynolds, Castile’s girlfriend, broadcast the moments after Castile’s shooting online, graphic footage that quickly circulated and drew international attention to the Twin Cities suburbs. The shooting on July 6, 2016, became part of an ongoing debate about how law enforcement officers use deadly force, particularly toward black men and boys, and it occurred during a particularly frenzied period that also saw a controversial police shooting in Baton Rouge and an ambush that killed five police officers in Dallas. In Minnesota, Reynolds calmly documented what happened after Yanez shot Castile, 32, a popular cafeteria worker at a local school. She explained into her phone that Castile was licensed to carry a firearm and that he had told the officer that before reaching for his wallet. Yanez approached the car window and asked Castile for his license and proof of insurance, which the driver handed over, the complaint states. Castile also told Yanez he had a firearm on him, and seconds later, the officer told the driver not to pull out the gun. Castile said he was not taking out the gun, which Reynolds echoed. Yanez screamed, “Don’t pull it out” and pulled his own gun, firing seven shots at Castile, the complaint states. Yanez and his partner, Officer Joseph Kauser, worked for the police force in St. Anthony. They were both considered model students before receiving their degrees in law enforcement in 2010. Both officers were put on leave after the shooting. Authorities did not charge Kauser, saying that he did not touch or remove his gun during the shooting. Prosecutors also charged Yanez with endangering the lives of Reynolds and her 4-year-old daughter, who was also riding in the car that night. On Friday, Reynolds said she was “incredibly disappointed” with the verdict, saying that Castile cooperated and was stopped only because “he had a wide nose and looked like a suspect” to Yanez. John Choi, the Ramsey County attorney who brought the charges last year, said he is disappointed with the outcome, but he called on people who protest to do so peacefully. Speaking on Friday after the verdict, Choi said he believes Yanez is a good person who made a mistake. But he said that nothing Castile did justified his death. According to the complaint, one of Yanez’s bullets went through the driver’s seat and hit the back seat. Reynolds’s daughter was sitting in a car seat on the other side of the car. Another bullet hit the armrest between Castile and Reynolds. Yanez pulled Castile over after seeing him driving, saying he looked like a suspect in a convenience store robbery from a few days earlier. Authorities later said Castile was not a suspect in that robbery. Castile was killed during an intense three-day eruption of violence last summer. A day earlier, an officer in Baton Rouge shot and killed Alton Sterling, another encounter captured on a video that went viral. 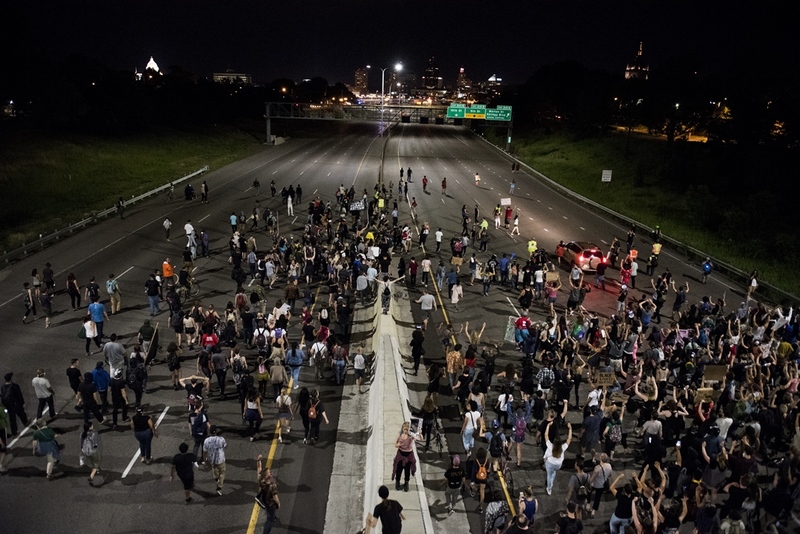 Castile’s death, like Sterling’s, set off protests across the country. At one of these protests taking place a day after Castile was shot, a lone attacker in Dallas opened fire on police officers, killing five and wounding several others in the deadliest single day for law enforcement since the Sept. 11, 2001, attacks. The attacker in Dallas told police he was angered by the shootings of Castile and Sterling, authorities said.